Research on the network based at the Bangkok Liaison Office and the Bangi Field Station was conducted chiefly through information gathering by meeting with the administrator of the campus network, particularly in the case of the Bangi Field Station, and observations. The research and setting up operations at the Bangi Field Station were conducted together with Mr. UMEKAWA Michihisa (Research associate of ASAFAS). It has been four years since I was first involved in setting up and strengthening the computer and network environment at our Bangkok Liaison Office, which opened in February 1964 as the first permanent overseas liaison office of a Japanese national university, and is now at a corner of a condominium at Sukhumvit Road, Soi 20 in Bangkok, Thailand. At present an ADSL (download/upload rate: 256/128kbps) communication line is used, and it is a good network environment, with an office wireless network and print server. Thailand is not at the level where constant Internet access is general, and even ADSL is metered in the same way as dial up (the monthly cost for 70 hours at a download/upload speed of 256/128kbps is 3,000 baht (approx. 10,000 yen). While constant connection using fiber-optic cables exists, it is not affordable. One could buy an automobile or a house with what the connection charges would be. However the information infrastructure is rapidly developing in recent years, and it won't be long before constant connection will become feasible. 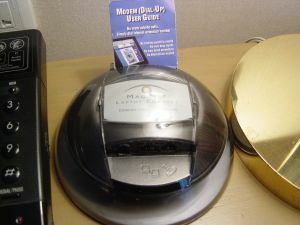 The hotel where I stayed was installing a constant connection service when I was there in 2000, and it can now be used. But the stability level of Thailand for transmission with Japan with the ICMP packet lost rate being 5-10%, can be said to be still at the developing stage. The Bangkok Liaison Office is using the LOXINFO ADSL service, so with an ICMP packet loss rate of virtually 0%, communications with Japan can be said to be stable. The information infrastructure has been so well laid in Japan that the very existence of a packet loss rate at all is said to show a deterioration in the state of communications. By contrast, even though Thailand is said to have come a long way compared to other Southeast Asian countries in developing its IT infrastructure, given that only a few years ago the packet loss rate was in the double digits, one can see that the country has made great strides. Mr. UMEKAWA has already given a detailed account in his report of the network environment, so I will skip that. 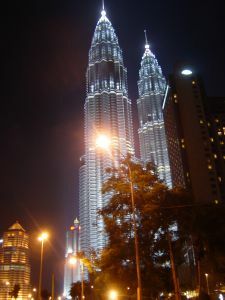 Dial-up connections are the rule in homes and hotels in the capital of Kuala Lumpur. And at the National University of Malaysia where the Field Station is located client computers are assigned private IP addresses automatically by the DHCP server, blocking communication from the outside. The network is also divided into several VLANs. And global IP addresses necessary for exchanges of communication with the outside are under constant monitoring by a data center. When the "MS blaster virus" was spreading in August 2003, infected PCs on the campus were detected through port scans. I could see that a lot of effort is being put into security, with Norton Antivirus software providing a permanent information security defense for educational equipment. We examined the stability of communications and the route to Japan using ping and traceroute, and discovered that there was a loss rate of 5%-10%, and that SINET was going through ATT, and commercial networks such as Yahoo and ZAQ (cable internet) through telelobe in Los Angeles. Mr. UMEKAWA and I spent two days setting up the computer network environment in the Field Station office. 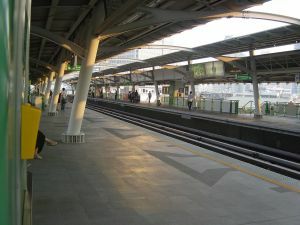 The MOU had just been concluded a few days before I arrived and at that point there was nothing in the station. So the first place we went to was a computer shop in Plaza Low Yet. 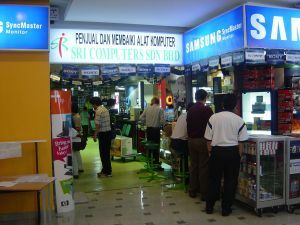 It seems that there are computer shops in other places such as Imbi Plaza and Sungai Wang Plaza, but we went to Plaza Low Yet because we didn't have much time and it was well stocked. 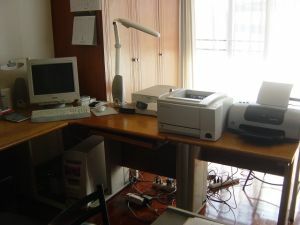 We installed a desktop system with a 17-inch TFT monitor, an ink jet printer, a laser printer, and installed security software (Norton Internet Security 2004). 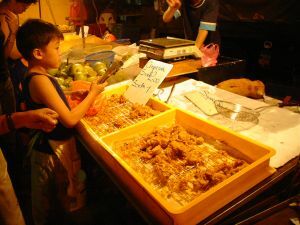 It is amazing how people in Southeast Asia bargain down prices. The listed price is perfunctory, and you lose out if you pay it. For instance, if you just ask the seller of a little item priced, say, at around 1,000 yen to "make it cheaper," he or she will cut around 200 yen off the price. 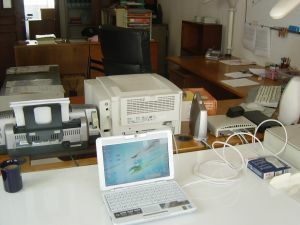 In the Field Station we were able to smoothly access the network with a dynamic IP address assigned by the DHCP server. Seeing that a Web proxy is not particularly necessary, it appears that NAT is used for the assignment of private IP addresses. From the fact that I was able to use the notebook I had brought to access my FTP server and SSH server in Japan, it would seem that the standard ports are not blocked. If I had had a little more time I would have liked to have experimented some more. Through this research trip I was able to gain a grasp of the telecommunication situation and ensure the smooth running of the communication equipment already installed in the Bangkok Liaison Office, and the network environment in Malaysia, where I was visiting for the first time. In Thailand I also tested video chatting and video conferencing, and felt how much communication facilities have developed in the last few years. 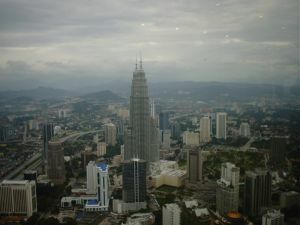 We did not have enough time in Malaysia, however, and we were not able to test the information transmission function by setting up a server using a global IP address. In Japan, communication and transmission of information using the Internet has become indispensable, but Thailand and Malaysia are right now going all out to strengthen their IT infrastructure. I would like to continue investigating the trends of infrastructure development so that we can someday construct a constant connection environment in the Liaison Office and create an information transmission system with our own domain.